This paper proposes an automatic method for registering images from different sensors, particularly 2D optical sensors and 3D range sensors, without any assumption about initial alignment. Many existing methods try to reconstruct 3D points from 2D image sequences, and then match 3D primitives from both sides. 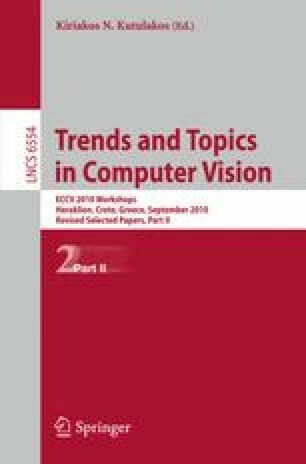 The availability of appropriate multiple images associated with 3D range data, the well-known challenge of inferring 3D from 2D and the difficulty of establishing correspondences among 3D primitives when there is no pre-knowledge about initial pose estimation, lead us to a different approach based on region matching between optical images and depth images projected from range data. This paper details our interest region extraction method for optical images and also the efficient region matching component. Experiments using several cities’ aerial images and LiDAR (Light Detection and Ranging) data illustrate the effectiveness of the proposed approach even when facing considerably geometric distortions. 1.Computer Science DepartmentUniversity of Southern CaliforniaLos AngelesU.S.A.